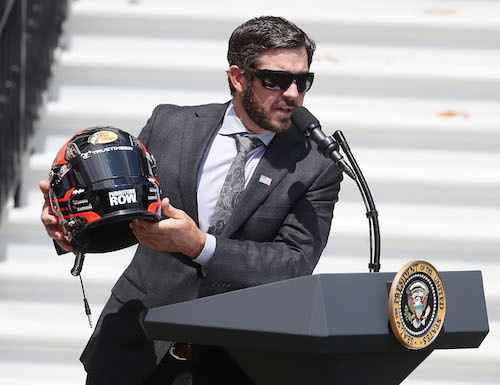 A move by Martin Truex Jr. to Joe Gibbs Racing for the 2019 Monster Energy NASCAR Cup Series has been popular speculation since Furniture Row Racing announced its closure, effective at the end of the 2018 season, earlier this year. Joe Gibbs Racing confirmed the move Wednesay. Truex and crew chief Cole Pearn will move from FRR’s No. 78 team to JGR’s No. 19 Toyota team. Truex will replace Daniel Suarez. Truex and Pearn are reigning Cup Series champion and in contention to repeat in 2018 as Truex is among the eight drivers remaining in the playoffs, ahead of the penultimate race of the 2018 season Sunday at ISM (formerly Phoenix International) Raceway. Truex and company have won four of the 34 races, so far, this season. Truex and Pearn will finish the season with the No. 78 team. Furniture Row Racing has had a technical alliance with Joe Gibbs Racing since 2016. Truex and Pearn joined FRR in driver and crew chief capacities the previous year. The 2015 season was Pearn’s first as a Cup Series crew chief, and Truex joined FRR after driving for teams including Dale Earnhardt Inc. and the now-defunct Michael Waltrip Racing. Together at FRR, Truex and Pearn have notched 17 wins in 141 races. Suarez will finish 2018 as driver of the No. 19. His future is unknown. He was promoted by JGR from one of its Xfinity Series entries after a 2016 championship in that series. He replaced the retiring Carl Edwards in the No. 19 ahead of the 2017 season.